If you checked out my Coconut Lime Pancake post, you’ll remember that I made CH his own batch of pancakes that same Sunday. It’s not that he didn’t like the Coconut Lime pancakes, he has just discovered a new found obsession with Nutella here in France and we all know that the way to a man’s heart is through his stomach. Well, I’ve already married the guy, therefore I already have his heart, but I decided to spoil him a little and make him these Nutella-chocolate pancakes for breakfast. Let’s just say, I had one happy husband for the entire day. The advertisers for Nutella have done an outstanding job promoting it as a ‘healthy’ breakfast item for kids and while I am not a nutritionist, I am not sure if I wholly agree with that. 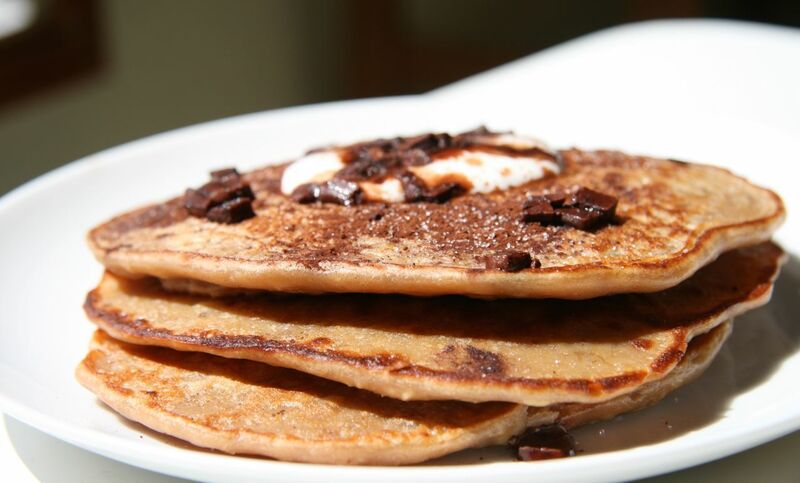 However, every once in a while as a treat, I say it’s worth it – and as an addition to Sunday morning pancakes, it’s even better. So, if you are looking to spoil someone or treat yourself, give these a try, you will not be disappointed! In a separate bowl, gently whisk together the eggs, sour cream, yogurt, water, Nutella and vanilla extract. 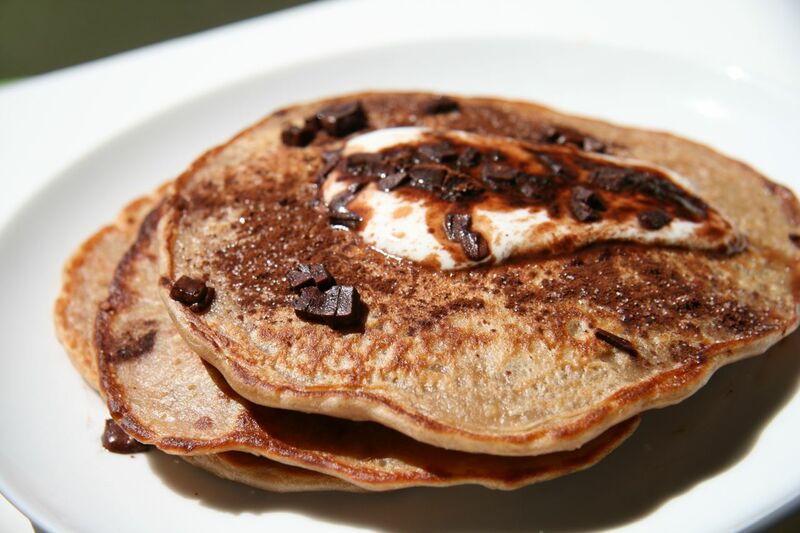 Serve immediately with a dusting of cocoa powder, chocolate nibs and a dollup of yogurt. This post looks like I am just giving you a recipe for lettuce, right? Well, I am not. I am giving you a recipe for the quintessential French bistro salad, and it is from none other than the famous (and simply incredible) Ms. Julia Child herself. Since arriving in France, I can confirm that they don’t indulge in a lot of vegetables during their main meals, or at least this has been my experience at the restaurants I’ve visited. However, most main plates are accompanied by a small green salad. But this isn’t just any green salad, this is the FRENCH green salad. It is dressed with the most perfect dressing, one that is light, yet flavourful and definitely not overpowering. I always yearn for more (and end up stealing CH’s off his plate). 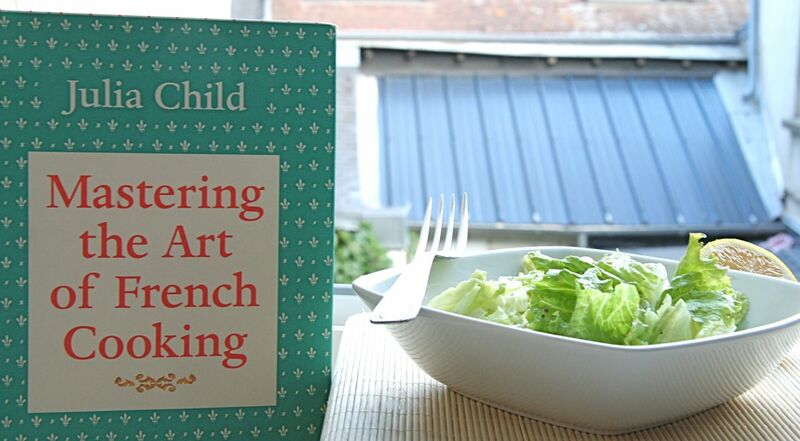 So, I have been on the hunt for a recipe for this dressing since I arrived in France and tasted my first bistro salad. I’ve probably tried about 5 or 6 recipes, and bought 3 types of oil. None of them have matched the bistro salads I’ve had. One afternoon, I was working away on some school stuff and I decided that I wanted to watch a food show, to get inspired (and to hear some English!). I clicked onto Hulu and up came 6 Julia Child episodes. I decided it was fate, given that these were French recipes, but in English. So, away went the books and I spent the afternoon enthralled with Julia Child & Jacques Pepin and all of their antics and recipes. The very last episode I watched was their “Salad” episode and what was their first recipe…yupp, none other than a simple French green salad. Julia Child described it as “one of the best things” and I couldn’t agree more. I watched the segment 3 times, just to make sure I got the ingredients correct and I tried to measure out by eye how much of each ingredient she was using, since she doesn’t state it explicitly. I ran immediately to my kitchen and made this salad (having just picked up a head of green lettuce that morning). I sat down and was immediately overjoyed. This was it – this was the salad I had been yearning for. So simple, so quick, but so special. You may have to play with the quantities of the ingredients a bit, depending on your mustard, olive oil and the acidity of your lemon juice, but keep adjusting until it suits your taste buds. So, if you are looking for a simple salad to accompany a flavourful main dish or just a taste of France – this salad is it. Also, do yourself a favour and watch a few Julia Child episodes, she is truly amazing. Her salad episode (on Hulu) can be found here. Enjoy a taste of France! Wash your lettuce and dry thoroughly (using a salad spinner). 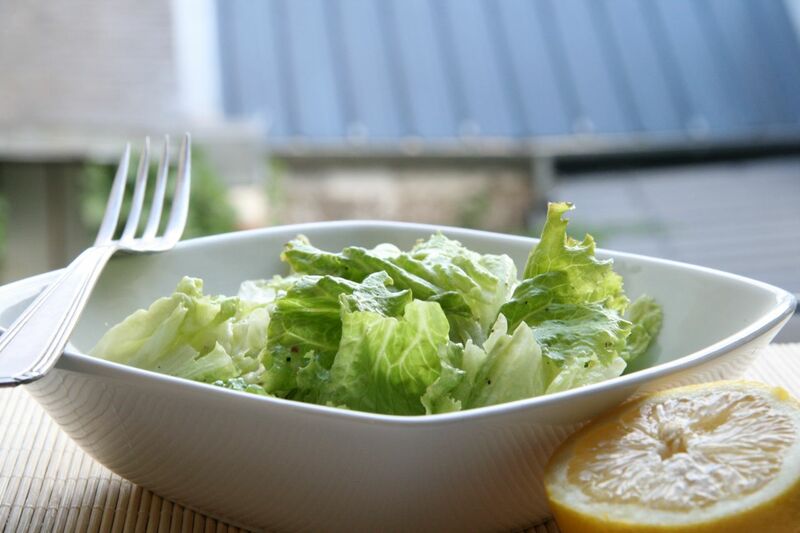 Tip – Jacques Pepin explicitly states that a salad should be cold, but not too cold. Therefore, wash your lettuce and dry it, and then prepare your dressing as your lettuce sits. In a small bowl, combine the mustard, lemon juice and S&P and whisk well to combine. Slowly, add the olive oil and whisk until smooth and well incorporated. That’s it. Place the salad in a large bowl and top with dressing immediately before serving. In my opinion, there is no better way to enjoy the best of the season than with this simple soup that requires no cooking. 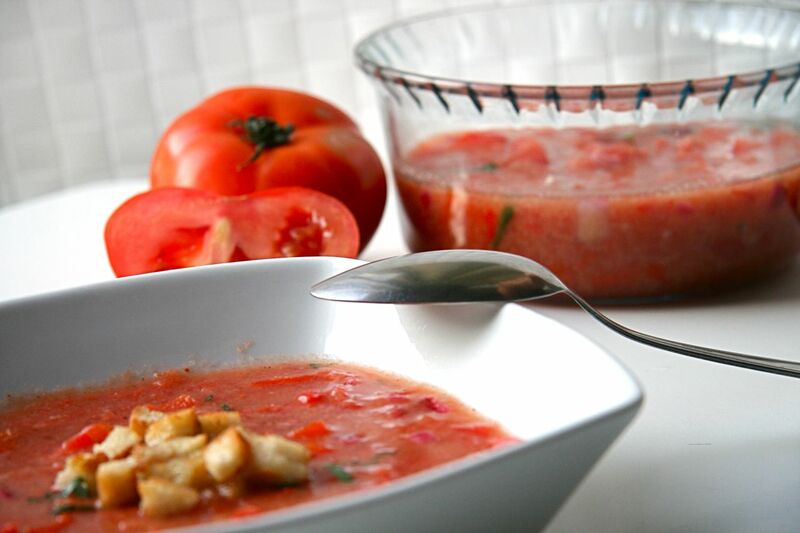 This is basically the French version of a traditional Gazpacho (which I cannot pronounce to save my life and it is the running joke with my two Spanish friends here in France…I swear, every time we go for tapas, they make me say it!). This soup was one of the easiest things I’ve prepared in a long time, except for the slight problem I encountered, given that I don’t have my handheld stick blender in France and the 6 euro food mill I bought just didn’t do the trick to purée the soup. Oh well, it was just a little chunkier than called for, but I didn’t mind. Even without cooking, the flavours of this soup are absolutely incredible. It is light and fresh, with a slight kick (which you can control with the addition of the cayenne pepper). It is absolutely perfect for a summer day, and it comes with the bonus that you don’t have to heat the stove to prepare it. CH and I enjoyed this soup with a fresh baguette the first night and the next day I prepare some pasta and tossed it with the leftover soup, which made for a delicious pasta salad that we took to the park with us. Sometimes it’s the simplest of things in life that we enjoy the most. 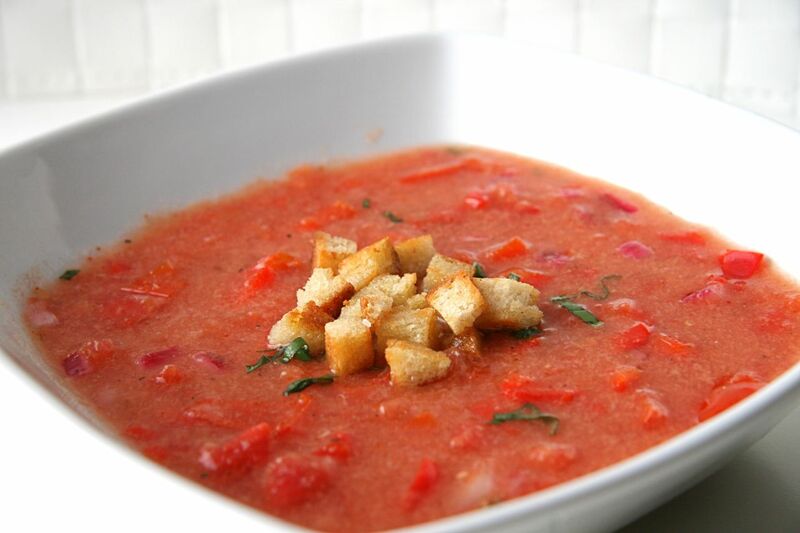 In a large bowl (preferably one with a lid), toss together the tomatoes, cucumber, onion, red pepper, garlic, breadcrumbs, red wine vinegar and 12 basil leaves. Stir the mixture well until evenly coated. Cover the mixture (with a tight fitting lid or with plastic wrap) and place in the fridge overnight, or for a minimum of 8 – 10 hours (the longer the better). The next day, remove the mixture from the fridge and using your handheld blender or a food processor, purée the soup until smooth. Add in a dash of cayenne pepper and taste. Adjust seasonings to your liking. You may also need to add a teaspoon of honey (or sugar), depending on how acidic your tomatoes were. Serve cold with the remaining basil leaves and croutons.